100% Food Magnesium Complex is one of the most nutrient-dense magnesium Foods available anywhere! Which is important because magnesium deficiencies are extremely common. Unlike other magnesium supplements, Food Magnesium Complex contains magnesium as 100% Food, and not in the form of molecular compounds officially referred to as mineral salts (or commonly referred to as rocks). Magnesium deficiencies have been found to occur in around 11% of hospitalized patients; it was found that 52% of patients in coronary care units, 42% of hypokalemic patients, 65% of ICU patients, and between 25%-39% of patients with diabetes have inadequate levels of magnesium [1,2]. “The higher percentage of fat and sugar in the American diet requires greater emphasis on magnesium-rich Foods” . “The percentage of absorption of ingested magnesium is influenced by its dietary concentration and by the presence of inhibiting or promoting dietary components” . There are no promoting dietary components in inorganic isolated magnesium salts, but there are in 100% Food Magnesium Complex. 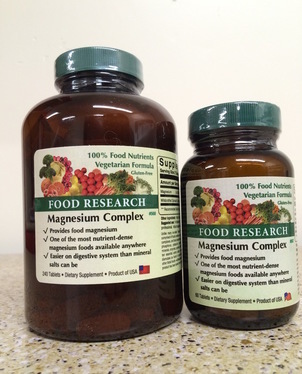 Food Magnesium Complex is better absorbed and retained than the typical mineral salts . Clinically, magnesium is perhaps most often used for muscle tightness and constipation. “Magnesium is involved in many enzymatic steps in which components of food are metabolized and new products are formed”; it is involved in over 300 such reactions . Clinical deficiency of magnesium can results in “depressed tendon reflexes, muscle fasciculations, tremor, muscle spasm, personality changes, anorexia, nausea, and vomiting” . “Magnesium deficiency produces hypercholesterolemia, hypertriglyceridemia, and dyslipoproteinemia by increasing VLDL and low density lipoprotein, and decreasing high density lipoprotein cholesterol. The alarming increase in sudden death from ischemic heart disease, and the increasing number of young men who develop myocardial infarctions and cardiac arrythmias or arrests in the past half century may be related in part to magnesium insufficiency. Magnesium deficiency may also be related to the increase in cancer” . In recent years, published studies have investigated the role of magnesium in alcoholism, arrhythmia, asthma, atrial fibrillation, autism, bleeding, blood pressure, bone loss, brain edema, bronchodilation, cardiovascular diseases, cerebral palsy, cerebrovascular disease, cholesterol, chronic fatigue, congestive heart failure, constipation, coronary disease, cystic fibrosis, dementia, depression, diabetes mellitus, eosinophilia myalgia, fibromyalgia, Grave’s disease, headache, hemangioma, hyperactivity, hypertension, hyperthyroidism, ischemic heart disease, menopause, migraine, mitral valve prolapse, muscle tension, myocardial disorders, neurological disorders, parathyroid function, patients requiring surgeries, platelet aggregation, PMS, renal failure, rheumatoid arthritis, seizures, systemic lupus erythematosus, ventricular disorders, and Wolff-Parkinson-White syndrome [1-7]. Plants convert soil constituents into food . Humans are supposed to consume Food, not soil . Yet most magnesium-containing supplements do not contain magnesium as found in Food, instead they contain various rocks known also as mineral salts. Consuming mineral salts poses at least two problems. The first is that the body has to attempt to breakdown the rock into its elemental (ionic) forms; which it is not really designed to do (even if the body is able to break these salts down into an ionic form they can be sequestered by fatty acids, rendering them nearly useless). The second barrier is that the body has to discard the non-magnesium portion of the salt as it may not be of any use to the body (if undesirable elements accumulate, they can contribute to toxic build-ups or free radicals in the body). A third possible problem is that magnesium is so concentrated in some mineral salts, it is possible that much of it will not be properly utilized by the body and may act as an irritant or may cause other nutrients to leave the body prematurely. According to one edition of the Nurses PDR, magnesium oxide cannot be used nutritionally and only has a laxative effect. Since it is a Food and not an irritating industrial chemical, 100% Food Magnesium Complex is the doctor’s (and nurses) choice for long-term magnesium supplementation. What Kind of Magnesium is in Your Magnesium Supplements? Magnesium Carbonate A component of soil/ an antacid and laxative . Magnesium Chloride Magnesium ammonium chloride processed with HCL/ fireproofs wood; cathartic . Magnesium Citrate Magnesium carbonate processed with acids/ a cathartic . Magnesium Oxide Soil magnesium often concentrated by high heat/ an antacid, cement, and laxative . Food Magnesium Enzymatically processed plant/ only used as Food. Magnesium salts are not Food--they are laxatives, antacids and cathartics--MAGNESIUM SALTS CAUSE THE BODY TO PURGE ITSELF! Magnesium oxide can be mined, but most commonly it is made by heating magnesium carbonate (a mined rock) to around 700 degrees Celsius . 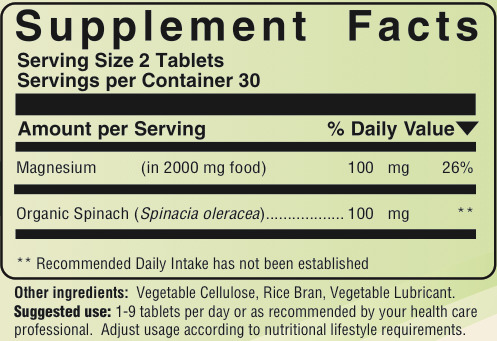 The apparent purpose of doing this is to concentrate the magnesium so that it can better fit into a supplement. The purpose does not appear to be to make it more like Food magnesium, nor to increase absorption. Magnesium oxide contains no complexed magnesium, Food magnesium does  (complexed magnesium is better absorbed [4,10]). Magnesium oxide, like most magnesium salts, is a laxative and an antacid (plus it is also used in certain cements!) , and thus may even promote the loss of other minerals from the body! Magnesium chloride’s main use seems to be to fireproof wood. So why would anyone wish to take these cheap imitations of Food magnesium as a magnesium source? Interestingly in 1999, the Nobel prize in medicine was awarded for the finding that humans need protein chaperones in order for minerals to be absorbed into the cell. Magnesium mineral salts do not contain protein chaperones, yet 100% Food Magnesium Complex naturally contains protein chaperones such as ceruloplasmin and ATX1 [11,12]. 100% Food Magnesium Complex also naturally contains minerals such as phosphorus and potassium which are needed for proper utilization of magnesium . 100% Food Magnesium Complex even naturally contains superoxide dismutase (S.O.D.). S.O.D. “is one of the most important enzymes that functions as a cellular antioxidant...The absence of this enzyme is lethal” ; studies show it is helpful for the heart, lungs, joints, kidneys, liver, muscles, and skin. 100% Food Magnesium Complex also contains rice bran and vegetable fiber, both of which contain fibers which are important for human health. Few women meet the national recommendations for fiber consumption . Dietary fiber helps regulate nutrient absorption, sterol metabolism, cecal fermentation, and stool weight . Shortages may lead to cholesterol problems, certain cancers, digestive problems, cardiovascular concerns, and nutrient problems [13,14]. Rice bran is also a Food complex source of silicon and B vitamins [6,15,16], which are also naturally in 100% Food Magnesium Complex. 100% Food Magnesium Complex remains THEFoodmagnesium choice. Why take cathartic industrial mineral salts? Contains naturally occurring carbohydrates, lipids, proteins (including all ten essential amino acids), superoxide dismutase, and truly organic bioflavonoids as found in enzymatically processed Saccharomyces cerevisiae, Rice bran Oryza sativa, Mixed vegetable fiber Cellula vegetabalis, Kelp thallus Ascophyllum nodesum, Dulse plant Rhodymenia palmatta, and Buckwheat rutin Fagopyrum esculentum all the nutrients shown above are contained in these foods. Unlike many so-called "natural" magnesium formulas, Magnesium Complex is a true food magnesium (not a mineral salt) contains no synthetic USP nutrients or mineral salts, but only contains foods, food complexes, and food concentrates.